As one of only a few law schools offering a first-year moot court competition, Syracuse University College of Law continues to prepare its students for courtroom careers and client advocacy. This year welcomed a record number of participants to the preliminary rounds of the Hancock Estabrook First-Year Moot Court Competition. Beginning with 78 students, and continuing with 56 rounds of competition over four days, finalists Jennah Pech and Kat DeMaria delivered final oral arguments on Feb. 20 in Hendricks Chapel in front of Federal Magistrate Judge David E. Peebles L’75, as well as Hancock Estabrook’s Managing Partner Janet Callahan and Partner Tim Murphy L’89. DeMaria, who is from Floral Park, N.Y., won the competition. “This competition is an exceptional opportunity for first-year students to step out of the classroom and into a courtroom. It was created two years ago with the goal of introducing our first-year students to the College of Law’s rich tradition of excellence in oral advocacy,” says Jason Feldman, the Hancock Estabrook Competition Director of the Moot Court Honor Society. Based on the original case of Eileen Page v. RollerDome, a tort action that arose out of a roller derby accident involving Page, the students argued a motion for summary judgment on two issues presented, including a statutory ground and the primary assumption of the risk doctrine. “This unique competition builds with difficulty after each round, and first-year students are always amazed at what they can do as oral advocates, even with only six months of law school under their belts,” says Cady Sinnwell Gerlach, executive director of Moot Court Honor Society. “Every participant walked out of this competition with better advocacy skills and more confidence in their abilities, and that’s what this competition aims to provide our first-year students,” she says. 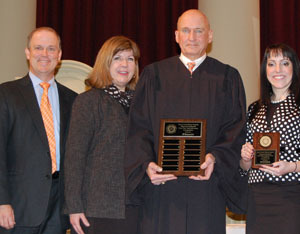 This year, with the generous support of Hancock Estabrook, LLP, the competition has truly become a cornerstone of the Moot Court Honor Society’s advocacy program.